TENOR GUITAR. TUNED GCEA. HEAVY GAUGE. In this section we offer strings designed for tenor guitar tuning G. D. A. E. OR C. G. D. A. OR D. G. B. E. OR C. G. B. D. OR D. G. B. D.
Available with ball-ends or loop-ends. For wound 3rd and 4th strings we offer nickel or phosphor round wound. The phosphor is bronze in colour and the nickel is gray, both give an excellent tone, and the choice is down to the players personal preference. On each page you will be asked to choose your preference in an options box. Postage to UK Destinations : FREE. I bought some of these for a Cigar box tenor guitar with a solid cedar top I made. I haven't used any different make of strings so can't compare but I don't think I need to as it sounds fantastic with these. They look and feel very nice. They also Tune very Easy. and don't seem to need much stretching. 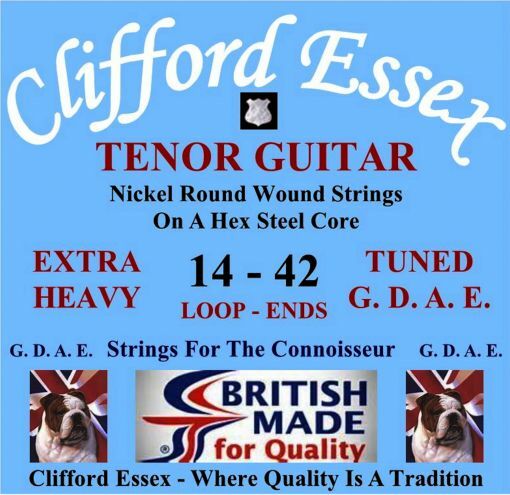 Great service very helpful advice very nice strings and made in the UK. TENOR GUITAR STRINGS. MEDIUM GAUGE. FOR G. D. A. E. TUNING. BALL-ENDS OR LOOP-ENDS. TENOR GUITAR STRINGS. MEDIUM GAUGE. FOR C. G. D. A. TUNING. BALL-ENDS OR LOOP-ENDS. TENOR GUITAR STRINGS. MEDIUM, HEAVY OR LIGHT GAUGE. FOR D. G. B. E. OR C. G. B. D. OR D. G. B. D. TUNING. BALL-ENDS OR LOOP-ENDS. TENOR GUITAR STRINGS. HEAVY GAUGE. FOR G. D. A. E. TUNING. BALL-ENDS OR LOOP-ENDS. TENOR GUITAR STRINGS. HEAVY GAUGE. FOR C. G. D. A. TUNING. BALL-ENDS OR LOOP-ENDS. TENOR GUITAR STRINGS. LIGHT GAUGE. FOR C. G. D. A. TUNING. BALL-ENDS OR LOOP-ENDS. TENOR GUITAR STRINGS. EXTRA HEAVY GAUGE. FOR G. D. A. E. TUNING. BALL-ENDS OR LOOP-ENDS. TENOR GUITAR STRINGS. ULTRA HEAVY GAUGE. FOR G. D. A. E. TUNING. BALL-ENDS OR LOOP-ENDS. TENOR GUITAR STRINGS. HEAVY GAUGE. FOR G. D. A. E. TUNING. CHROME TAPE FLATS. STUDIO STRINGS. BALL-ENDS.